WXRT: Sold Down the River? "It was one of the last radio stations owned by a guy." You had to hear the sentence to catch the intonation of those last two words, pronounced with a northwest-side twang and implicit approval. 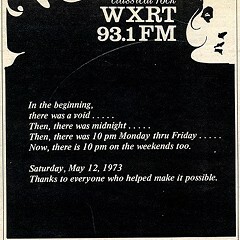 The speaker was an 'XRT staffer, summing up the loss of one of the last independent radio stations in America. The "guy," Danny Lee, was for 22 years the beneficent father to a station with a programming-staff turnover rate of almost zero. But now dad was saying good-bye, having announced his intention to turn over the station to corporate ownership for an estimated $44 million. By selling to Group W, the Westinghouse-owned radio chain (FCC approval will take several months), he leaves WXRT--and its staff--to an uncertain future. Everyone involved says that Group W won't change the format of 'XRT or that of the sports-talk station WSCR ("the Score"), for which they spent another $14 million. Group W currently owns 18 stations, including major rock outlets in Pittsburgh (KDKA), Philadelphia (WMMR), and most prominently New York (WNEW, a station as respected as 'XRT). "We value 'XRT's unique position," says Group W chief flack Gil Schwartz. "We're not going to do anything to change it. We like the station." Lee believes him. "They paid a premium price for the station. You don't pay that much money if you're going to gut and remodel." But neither do you pay $44 million for a toy and then not play with it. And any change at WXRT is big, since change there is rare. The "guy" was a son of a "guy" as well. Louie Lee was running a small appliance shop in the postwar years when a friend said, "Hey Louie, you fix radios, why don't you buy this radio station?" Lee took over a brokered AM foreign-language outlet, WSBC, and to complement it bought the last open FM license in Chicago a few years later. It cost him a few hundred dollars. He called it WXRT. At the time FM was moribund, but Lee discovered that immigrant listeners were more familiar with the format than natives. By the early 70s his son Danny Lee had taken over the business. In 1972 he let a trio of ambitious hippies--one of whom, Seth Mason, remains his key lieutenant--convince him to start running rock 'n' roll in the evening. By 1976 the station was playing rock all day and all of the night, and had begun to cultivate a famously loyal and persnickety listenership. While not without its flaws (notably an irritating tendency to confine its ethnic-music mix to token spins of blues), the station's great strength was its mainstream but determined eclecticism and support for new artists. The eclecticism was supported by an adult and moneyed audience whose affection for the station kept the advertising income higher than its ratings would otherwise have dictated. This income allowed Lee to maintain a long-term approach to managing the station, sticking by programmer Norm Winer through good ratings periods and bad. While Schwartz claims that Group W's approach will not be much different ("I reject the supposition that we do not have a long-term view"), it's probably true that Chicago's heavily competitive rock-radio climate and the very high purchase price will soon give Group W excuses to start tinkering. Such changes could be programming-based--the station could start edging more alternative to compete with current ratings champ Q-101 (where I do a radio show). Group W could also make personnel changes--aside from having to honor the contracts of certain daytime jocks, the new owners have made no commitments to the station's air staff. Overnight, the deal made Lee, sole owner of the station, one of the more liquid businessmen in Chicago. While the IRS will presumably whittle down the windfall somewhat, there can't be too many businessmen sitting around with $50 million or so cash in the cookie jar. Lee says that several things factored into what he called "the major decision in my life." One, he notes frankly, was the money; another, the feeling that, having spent his life building 'XRT, he and his family "should have some time to enjoy it." Third, both he and Mason--now his partner in three stations in Oklahoma City--complained of the red tape involved in taking the Score to 24-hour-a-day broadcasting. "We spent 18 months of agony with the FCC, laboring to have essentially three hours of work done," Lee says. Making up for that agony was the $14 million Lee pocketed for the Score, which cost him $1 million three years ago. For now the pair will oversee their Oklahoma stations from Chicago and look for new radio properties. For Mason, the onetime hippie whose programming vision was the station's foundation, the end is somewhat bittersweet. "I had thought the whole thing out and thought I was ready for it," Mason says. "But once I saw the faces [of the staff] I realized I wasn't quite ready." Even if the deal does ultimately mean the end of 'XRT as listeners have known it, it's difficult to fault its founders, who stuck with it longer than they had to. "You're given a license to serve the community and that's what I think we did," says Mason. "We've done everything you could ask for in terms of being responsible broadcasters; we built radio stations that became part of people's lives. That's what I'm going to take away with me." Art accompanying story in printed newspaper (not available in this archive): Photo/Peter Barreras. So Many Records, So Little Time? The WXRT Question: How Do You Grow Up Without Selling Out?